Have You Found Your Word of the Year Yet? Do you choose a word of the year? Many people participate in this practice – yearly choosing a word or phrase to frame or accompany them in the next 12 months. Some people will even say their mind didn’t do the selection, but the word settled on its own in their hearts. I have followed this practice for the last few years and am always amazed how the word weaves itself throughout my life. The word pops up in quotes, in my reading, in conversations. I hear it in prayers and sermons and presentations. I will be walking and an image of the word bubbles up. I hear it in dreams and in emails. My word grounds me, gives me an anchor for the year and helps me focus. Only one year, did the word never add much to my spiritual growth. I should at some point go back and reread my journal from that year and see if that word breathed more life into my life than I realized or maybe another word intertwined that year that I never noticed. In the third and fourth centuries, men and women seeking God would live in solitude, silence and continual prayer in the deserts and wilderness outside of the towns in the Middle East. These Desert Mothers and Fathers gained a reputation for wisdom and many would seek their advice for their lives. People would find an Abba or Amma and ask, “Give me a word.” This word or phase would be something for them to ponder for guidance and knowledge. One word could last a whole life. One word could transform a whole life. I wrote a blog post last year about how to choose a word of the year – click here for the post – and you may find reading it again useful. The process to opening your heart to a word is found in listening, paying attention and noting. Start with asking God to help you find a word of the year. What word will draw you closer to God? Listen to what you need or desire in the season of your life. Is there a hunger? A longing? Is there a way you want to feel, change, grow in the next year? Say the word out loud. Does it sound right to you? Does it appeal/excite/taste good to you when it passes over your lips? Does it ring in your heart? Pay attention to words that resonate or shimmer in your soul. Your word likes to play hide and seek and often will peer out at you in surprising places. Pay attention. Begin taking notes of potential words of the year. Fun to watch how one word leads to another then another until the final one emerges. Give the process time. You don’t have to have just the right word by a magic date on the calendar. Like the best tasting stew, allow the flavors to simmer. Trust your spirit. Trust THE spirit. Abbey of the Arts offers a free 12 day online mini retreat to help uncover your word of the year. Here are a few examples of a word of the year to help you get started. A more complete list of ideas can be found at this website. I wrote down the word “reach” towards the end of November. There was something about that word that called to me. Reaching upward, reaching out to others, reaching inward to my soul. The action in the word reach felt like an invitation to my heart. I felt a deep desire to grow in being mindful of whomever I was with in a more engaged way. I felt drawn to being present in a deeper fashion. My desire was to give my full attention to what or who was before me. I wanted to practice full listening, not planning my next sentence or thinking what else I needed to get done. Deep, not shallow presence. I didn’t want to rush my time with God nor rush my time with others. Then I sat back and watch how one word led to another to another – slowly unfolding and emerging. My word of the year appears to be Attentiveness. I will hold this word lightly for about another week to let it take root in my spirit but I think this may be the one. How about you? Do you participate in the practice of a word of the year? How has it helped you? I have done this before, but not in several years. Thank you for encouragement, Jean. Yes, like others, my word chose me. Back in November the word “awaken” kept coming to mind. In addition, every time it came to mind it resonated in my heart. Many days during my prayer time I used colored pencils and wrote the word in large decorative letters across the page in my journal. I retired a few months ago and am eager and excited to “awaken” to what God has placed in my heart that has been lying dormant, waiting for this time in my life. On a side note, the position I retired from was Activity Director in a memory care center. In reality it was a ministry not a job and I loved it. That position is how I became acquainted with you, Jean. You were the closing speaker at the Ohio RAP conference in Columbusa a few years ago and I have never forgotten you. You were so encouraging then and you still are! Linda, I am thrilled to hear from you and congrats on your retirement. I know I have certainly enjoyed this new phase of life. Awaken sounds like a perfect word for this season for you. great choice. May God awaken within you the truth about how much He loves you and that you are valued for who you are as his child. Thanks for your kinds words about my presentation in Columbus. That is encouraging. So glad we connected and lets keep in touch! I’ve never done this, but I think for 2017 I am going to give it a try. If I had to list just one word, it would be “kingdom,” but I believe for me a phrase is more accurate “living and resting in the kingdom.” I’ll let it sit for the next week and see if God refines/confirms it. What a powerful word, Debra. I am amazed at this simple yearly habit and its impact throughout the year. I just reread my journals from 2016 and loved the thread of joy, my word last year, weaving through my experience. Quite a few lessons too. And while looking for the patterns lefts by joy I discovered other lessons. God is so good to nourish our spirits! Happy New Year! What a treat you are in for! 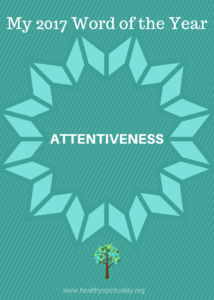 Attentiveness is an exciting word. I’ll look forward to hearing how you and God are working this out this year. I *think* my word for 2017 is “Story” but still letting the Spirit refine it. Thanks for the encouragement on my word, Lisa. I love the word STORY for you. That will hold lots of wisdom I am sure! I have chosen (or it has chosen me) a word for the year, Jean, and I thought about how it fits as I read your tips here. Kind of like a litmus test! I do think it will work, though I’m waiting until I’m back to blogging in January to share. Thanks, as always, for your inspiration and guidance! yes yes I fully believe a word choses us as much as we chose it. amazing isn’t it? Can’t wait to hear your special word.